In the wake of GermanWings' terrible incident of flight 9525, I have noticed that the crash location is quite far from the shortest route connecting the two airports. 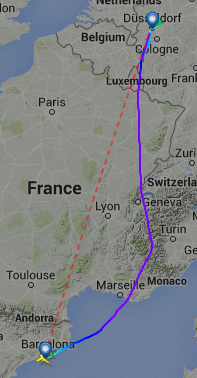 Other companies that fly the same route (Vueling 1894, Airberlin 8947) follow the same flight paths. Why is this? What limitations are in place that prevent these aircraft from flying over Lyon (and "nearby" region)? Large parts of France's airspace are designated military training areas. 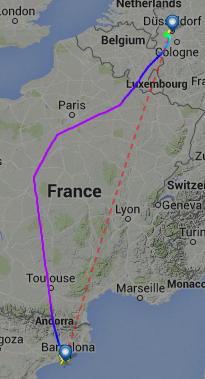 If there is military flight training going on, the choice of routing over France is very limited. 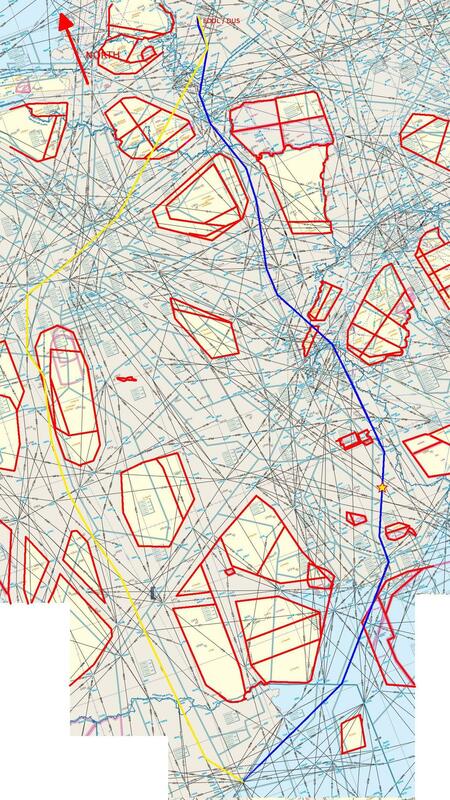 The only option is to fly around these areas, which results in the routes you found. Since the PDF seems to be giving problems on some computers, I've combined several screenshots and drew the approximate route of your westerly flight (in yellow), the planned flight of GWI 9525 (blue) and Temporary Segregated Airspaces (TSA's) in red onto the map. The crash location of GWI 9525 is marked by a red/yellow star. Note that not all the TSA's in the map are actively used at all times and that in some cases crossing is allowed but altitude restrictions apply. In addition to active TSA's there are other considerations that come into play such as weather and airway capacity & demand. If you have to wait 15 minutes longer for a slot on the shortest route, you might as well fly a slightly longer route if that allows you to depart earlier. While DeltaLima's answer is very good, it is also due to Air Traffic Control limitations-- you want to spread out where the traffic is across the whole airspace, so routes may dogleg left or right at one point to try to keep traffic flow good (also helps separate aircraft going in opposite directions, but altitude does that too). Keep in mind that the arrival patterns into certain airports have defined entry points and are designed to line up the plane in a certain way for the airport, and flights may have to go slightly out of their way to join the arrival. Not the answer you're looking for? Browse other questions tagged airline-operations flight-planning flight-path france or ask your own question. Why is the flight path from Taipei to Tianjin not a straight line? Why do commercial flights avoid overflying Shandong Province? What's the difference between TWEBs and TIBS? What's the difference between Free-Flight and Free-Route? Is it economically viable for Emirates to use a 777 for some of these routes? Where can I find the planned and flown paths for certain flight routes? Why are westbound transatlantic routes located hundreds of km away from eastbound routes?